Here’s a version of an app I’ve been using for such a long time ever since owning a smartphone with LED lights. I love having a torch anywhere. You never know when you’ll need one, and when you do, it’s really handy that it’s on a phone. 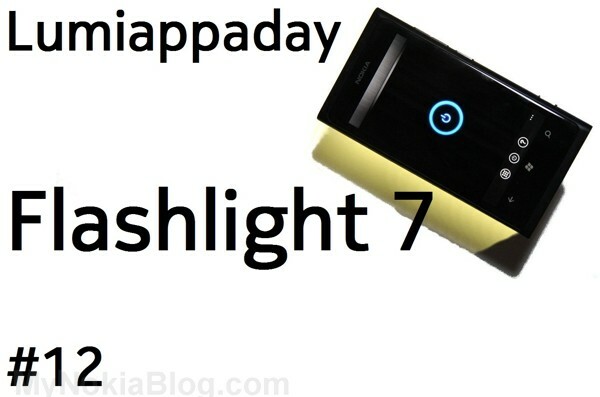 This app is called Flashlight 7 – it’s free and it lets you use the Lumia 800’s dual LED’s as a torch. The start screen is quite nice looking. You have this button that lights up blue when the LED is on. There are also other additional features that uses the Lumia 800’s 3.7″ display. You can see that in the video. There’s also an on/off button in the standard WP toolbar, not sure why it’s there. When you start up Flashlight 7, the LED lights will come on. That’s how it should work – no waiting for you to switch it on since that’s why you turned the app on in the first place. quite like that it disables the camera button so you don’t inadvertently switch the LED off when you’re using it. I’ll ignore the other features as the main use for this is LED torch. There’s a question button that gives you instructions on the controls. The torch automatically switches off when the screen is locked, or when you multitask. It does take about 4 seconds to start up. Once it has started, you can quickly switch the LED on or off. If multitasking the LED does turn off, but the moment you switch it back to Flashlight 7, the LED comes back on instantly. This app appears to have have some stability issues though where it appears like it takes ages to turn the light on. I think it’s a bug where if you turn it off and turn it back on, the blue light indicates it’s on but you have to tap it again. The additional features work well, they’re fast enough though the kaleidoscope looks a little slow. Not related to the app, but the LEDs are pretty bright. I’m having that blackspot phenomenon as I type this. Camera LED still works (just checked as I saw a comment saying their LED doesn’t work at all). Free. You can only see the ads if you go into the settings page, the app if just using the torch is ad free. There appears to be a paid version too. Conclusion: Despite the relatively low scores, this is something I would put on my instant download list because it will be something I’d find extremely useful. I wasn’t even aware of this app and was just using video recording on my Omnia7, deleting the video afterwards. Now I’ve got no need to. This developer already has made two revisions (of which you would have been automatically informed by the marketplace tile) so I’m sure the button bug would be sorted eventually. As usual there is the warning that you could burn out your LEDs. Since I’ve been using my phone LEDs as torches, that’s never happened to me. But just be warned it could happen.